: My Mother is a huge Fan of Elvis Presley since she was a kid. So she would play all his music and watched his movies every single day. And then I was born and I would grow up listening and watching The King of Rock n Roll. When I got older and on my own are started to collect his stuff. By the way, I'm 33 years old now. : His music, his voice, his looks and the way he shook those hips. "My Message to Elvis": Would be, Elvis. I Love you so much, you are my hero and I will always Love you and your music. : To tell you the truth. I don't have a favorite. I Love everything he sings, but I do listen to this one song that makes me cry. "Just Pretend" he sand that song with all his Heart and Soul and just so beautiful to listen to. Now my favorite Movie would be " Blue Hawaii". It was funny and also the ending where he got married was so beautiful. I wish I can get married like that. : His patriotic eagal suit. I Love that one so much. : His Mother, even though Lisa Marie was born. But he Loved his Mother so much, it killed him when she Past on. It really broke his heart. : I was three years old when he died so I have no answer for this one. : His music. Because when he was alive, he change the face of Rock n Roll. Till this day, his Music still feels like it's brand new. His music will never get old. : No. I really wish I could go so bad. That would be a dream come true. :: Right now I can't think of one at the moment. So maybe in the future I will have one. There is so much to say about him and don't know where to start. Would you like to tell us a little bit more about yourself to share on your own Elvis Presley Fan page? : I'm 33 years old and Live in Hamburg, Pa. I have two beautiful kids that I adore. I have a girl 16 name Shaundra and a son 14, name Adam jr. I have a Boyfriend Stephen, 57 YRS, he is a Vietnam Veteran, U.S Airforce. I also have a cat name Phoebe Marie. I Love to collecting anything and everything of Elvis Aron Presley. : NO. I think you are doing a wonderful job on this site. You are honoring The King of Rock n Roll. Thats all that matters. Lets keep his Memories alive. Thank you kindly for your comments on our survey. Sounds like you adore this wonderful man too, it`s not had to fall head over heals for him. 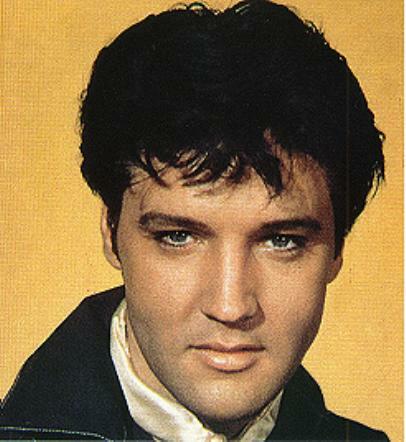 Elvis was just amazing, his looks, voice, personality; he is just absolutely perfect in all areas. `Blue Hawaii` is also my favorite, the wedding song I just love it. It would be so wonderful to have such wedding. I hope your dream comes true and you get the chance to visit Graceland, im sure its an unforgettable feeling and a memory treasured for ever. I also hope to visit his home, I live in Australia, so I don`t like my chances. I love to honor our king on my site; it`s my way to say thanks to the man I adore for the love and passion he offered to his fans. Elvis has been a huge influence in my life. All the best to you and your family Elizabeth, take care.